Get the next edge to be processed. Causes vertices in the queue to be expanded (if necessary) and therefore effects the run timings of the algorithm, but helpful for some videos and debugging. Get the value of the next edge to be processed. Causes vertices in the queue to be expanded (if necessary) and therefore effects the run timings of the algorithm, but helpful for some videos and debugging. Enable "strict sorting" of the edge queue. Rewirings can change the position in the queue of an edge. When strict sorting is enabled, the effected edges are resorted immediately, while disabling strict sorting delays this resorting until the end of the batch. Enable pruning of vertices/samples that CANNOT improve the current solution. When a vertex in the graph is pruned, it's descendents are also pruned (if they also cannot improve the solution) or placed back in the set of free samples (if they could improve the solution). This assures that a uniform density is maintained. Set the fractional change in the solution cost AND problem measure necessary for pruning to occur. Get the fractional change in the solution cost AND problem measure necessary for pruning to occur. Get whether we're using just-in-time sampling. Stop the planner each time a solution improvement is found. Useful for examining the intermediate solutions found by BIT*. BIT* (Batch Informed Trees) is an anytime asymptotically optimal sampling-based planning algorithm. It approaches problems by assuming that a simple solution exists and only goes onto consider complex solutions when that proves incorrect. It accomplishes this by using heuristics to search in order of decreasing potential solution quality. Both a k-nearest and r-disc version are available, with the k-nearest selected by default. In general, the r-disc variant considers more connections than the k-nearest. For a small number of specific planning problems, this results in it finding solutions slower than k-nearest (hence the default choice). It is recommended that you try both variants, with the r-disc version being recommended if it finds an initial solution in a suitable amount of time (which it probably will). The difference in this number of connections considered is a RGG theory question, and certainly merits further review. This implementation of BIT* can handle multiple starts, multiple goals, a variety of optimization objectives (e.g., path length), and with just-in-time sampling, infinite problem domains. Note that for some of optimization objectives, the user must specify a suitable heuristic and that when this heuristic is not specified, it will use the conservative/always admissible zero-heuristic. This implementation also includes some new advancements, including the ability to prioritize exploration until an initial solution is found (Delayed rewiring), the ability to generate samples only when necessary (Just-in-time sampling), and the ability to periodically remove samples that have yet to be connected to the graph (Sample dropping). 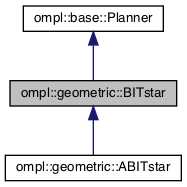 With just-in-time sampling, BIT* can even solve planning problems with infinite state space boundaries, i.e., (-inf, inf). J. D. Gammell, S. S. Srinivasa, T. D. Barfoot, "Batch Informed Trees (BIT*): Sampling-based Optimal Planning via the Heuristically Guided Search of Implicit Random Geometric Graphs," In Proceedings of the IEEE International Conference on Robotics and Automation (ICRA). Seattle, WA, USA, 26-30 May 2015. DOI: 10.1109/ICRA.2015.7139620. Illustration video. Definition at line 107 of file BITstar.h. Delay the consideration of rewiring edges until an initial solution is found. When multiple batches are required to find an initial solution, this can improve the time required to do so, by delaying improvements in the cost-to-come to a connected vertex. As the rewiring edges are considered once an initial solution is found, this has no effect on the theoretical asymptotic optimality of the planner. Definition at line 1141 of file BITstar.cpp. Drop all unconnected samples when pruning, regardless of their heuristic value. This provides a method for BIT* to remove samples that have not been connected to the graph and may be beneficial in problems where portions of the free space are unreachable (i.e., disconnected). BIT* calculates the connection radius for each batch from the underlying uniform distribution of states. The resulting larger connection radius may be detrimental in areas where the graph is dense, but maintains the theoretical asymptotic optimality of the planner. Definition at line 1161 of file BITstar.cpp. Delay the generation of samples until they are necessary. This only works when using an r-disc connection scheme, and is currently only implemented for problems seeking to minimize path length. This helps reduce the complexity of nearest-neighbour look ups, and can be particularly beneficial in unbounded planning problems where selecting an appropriate bounding box is difficult. With JIT sampling enabled, BIT* can solve planning problems whose state space has infinite boundaries. When enumerating outgoing edges from a vertex, BIT* uses JIT sampling to assure that the area within r of the vertex has been sampled during this batch. This is done in a way that maintains uniform sample distribution and has no effect on the theoretical asymptotic optimality of the planner. Definition at line 1151 of file BITstar.cpp.